UC Santa Cruz launched four new bi-lateral student exchange agreements in 2018, providing expanded study abroad opportunities to our undergraduates. During this fall quarter, three students from the Technical University of Denmark are studying at UC Santa Cruz and one UC Santa Cruz Film and Digital Media undergraduate student is studying at the University of Sussex's renowned Media and Film Studies program. UC Santa Cruz Exchanges are department or campus-based undergraduate study abroad programs that leverage working and research relationships among faculty to promote student mobility between institutions. Students will earn UC credit through the new UC Santa Cruz direct exchanges while gaining a valuable intercultural experience and being exposed to new or different academic perspectives through studying abroad. Exchanges may be for one, two, or three academic quarters and are built around an academic program or department. Situated on the coast, Aarhus is considered to have a university-town atmosphere, with a vibrant food scene and cultural attractions. Aarhus University is the second oldest university in Denmark and offers a wide range of courses in English, including the arts, humanities, physical and biological sciences, social sciences, and engineering. For additional program details, visit studyabroad.ucsc.edu. Study abroad in the vibrant city of Barcelona, Spain, at the Autonomous University of Barcelona (UAB), an institution well known for its excellence in research and teaching. This program offers students a unique opportunity to enroll in courses at UAB that fulfill Economics major requirements. Technical University of Denmark (DTU) is located in Kongens Lyngby, a northern suburb of Copenhagen located about 10 miles north of the city center. Students will find more than 1200 courses taught in English in the natural and technical sciences, including computer science, physics, chemistry, and engineering. 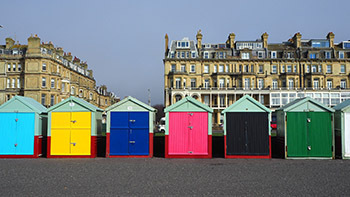 Study abroad in the beautiful coastal town of Brighton, England, at the University of Sussex. Renowned for their Media and Film Studies, this program offers students a unique opportunity to courses at the University of Sussex that fulfill Film and Digital Media major requirements.